Will tighter security slow U.S. carriers' recovery? Airline passenger traffic fell a catastrophic 33.2 percent after Sept. 11. 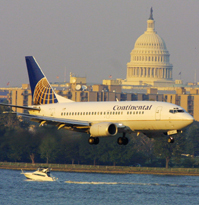 Carriers slashed services, furloughed workers and canceled orders for new planes, but they still lost an estimated $7.7 billion in 2001. The picture would have been worse without the government's $15 billion rescue package. Most aviation experts say the airlines were struggling before the terrorist attacks due to declines in high-priced business travel. In any event, new aviation-security legislation has created another challenge for the airlines: the hassle factor. The new law gives responsibility for airport security to a new federal agency. But many travelers say they don't want to deal with the long check-in lines, shoe inspections and other inconveniences they now encounter.